Last post, we introduced Ti Parts Workshop's extensive assortment of weight-saving parts for Brompton folding bikes. TPW is about more than that, though. Titanium nuts and bolts and other mostly hidden parts aren't super exciting to everybody, after all. Back when Brompton introduced their Superlight offering in 2004, part of the package was a titanium seatpost. This swap saved more weight than any other single part. Moreover, the ti posts flexed more than steel, adding vertical compliance over and above the rear suspension. Unlike the standard (soft) rear suspension that can rob power from pedaling in compression (boing boing boing), the ti post has zero interaction with the drivetrain. Finally, the titanium's rougher finish than chromed steel made these posts less prone to slippage. Brompton stopped offering these posts several years ago. Within months, prices for used ti Brompton seatposts on eBay shot up to near $500! With demand like that, it wasn't long before various Asian machine shops got in on the action, offering their own ti posts for Brompton. Word is, though, that some of these, in haste to claim lightest weight at lowest cost, are prone to failure. Naturally, Ti Parts Workshop offers ti posts, in both standard and extended lengths. They are proud to note that theirs are heavier than some others -- still saving 1/3lb over the steel -- because safety comes first, even for riders up to Brompton's warranty limit near 250lbs. They are also beautifully finished in several colors, bling bling. After fitting Ergon grips, a ti seatpost is the single best tip I've got for improving a Brompton's comfort on rougher surfaces, and it remains the most significant weight saving opportunity for a single part. Bromptons come with a well-engineered folding pedal on the left side, and a basic pedal on the right. 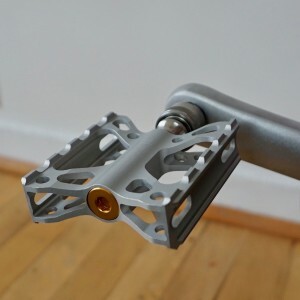 By "well-engineered" I mean that it folds very narrowly, holds up well, and is stiffer than other folding pedals we've seen. It's not light though, with a smallish platform, and its bulk prevents your foot from hugging the crank arm. It can also exhibit a small amount of play that can progress to an audible tick. MKS from Japan has long offered a superior series of quick-release "Ezy" pedals. It turns out to be a lot easier to engineer a quality removable pedal than a folding one! 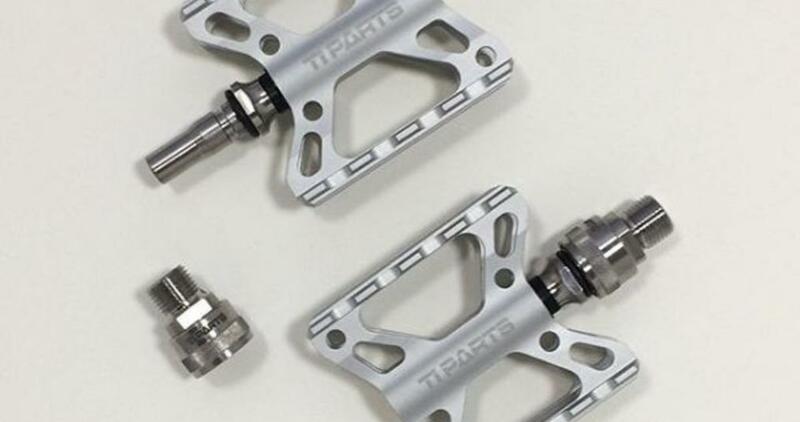 Now Ti Parts Workshop offers similarly great pedals, compatible with MKS's Ezy release system, but executed in titanium instead of steel for the spindles and release mechanism. Buttery smooth, all-metal, and saves 6 or more ounces off the originals depending on variant: even more weight saved than the seatpost swap! We stock also a rear-axle-mounted holder so no need to pocket the released pedal. Me? I will continue to pocket the pedal when I leave the bike locked outside, as a soft security measure. I reason a thief may think twice about stealing an un-rideable bike. Brompton's stock hinge clamps are a triumphant exemplar of KISS. They are secure, strong and ... simple, never developing slop like those of some other folding bikes. Several people and companies have nevertheless developed improved versions, offering better function and looks. TPW's versions are the best we've seen yet. With the stock Brompton clamps, to fold you must back out the hinge clamps far enough for the flanges to clear, allowing the hinges to open. But at this point, the clamp plates are free to rotate 360 degrees, meaning they drift out of alignment with the flanges on the hinge. When unfolding the bike, you must manually align the plates again before tightening. By making the clamp plates asymmetrical, with one flange engagement face longer than the other, it's possible to open the hinges without the plates free to rotate out of alignment with the hinge flanges. Another improvement: Brompton's stock clamps can be backed out entirely for removal, which is nice if you need to surrender the bike to a baggage handler, who might not know to protect the clamps in their vulnerable position at the corners of the folded bike. Removing the clamps and pocketing avoids the danger. But the cost of this functionality is that every time you loosen the clamps, you tend to waste a few turns, unscrewing more than necessary. Upgrade assemblies thus include a stop nut on the main bolt body, to prevent backing out further than necessary to open the hinges. 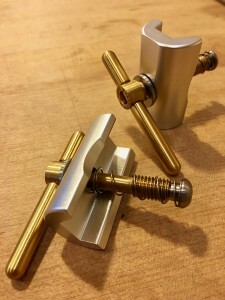 TPW's implementation of this feature is the most elegant we've seen, the stop being removable without tools when advisable to demount the clamps, and the first with low enough a profile to retain compatibility with the popular Brompton toolkit: the chunky stops of the others collide with the tool. Further refinement: a spring pushes the plates off the flanges, ending any need to intervene manually. TPW's have this also, using a titanium spring! And of course the whole thing uses ti instead of steel, saving ... 24 grams. Available in several pretty finishes. All together, these enhancements can shave a few seconds off every fold/unfold sequence. The world may be crashing down around us, but the important thing is that your clown bike can be SO dialed, you'll have more time to protest. A parked or folded Brompton rests on some small wheels. They roll, but not particularly well. 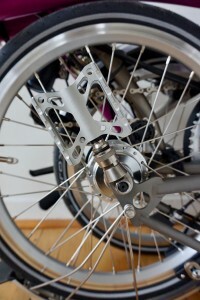 Brompton offers an upgrade larger diameter set of "EZ Wheels" that satisfy more people, but not all. Just as a two-niner is going to outrun a Brompton in an offroad race, when it comes to ease of rolling on poor surfaces, diameter is king. TPW's largest Easy Wheels measure 3 inches in diameter, the largest we've seen, while remaining slim enough not to strike ankles. In aluminum and titanium instead of the stock plastic and steel, they do add a little weight, but they look awesome.